2P START! Live! : Two Years Old Edition | 2P START! It’s hard to believe we’ve been doing webcomics for two years, so we put a little extra love into this excellent podcast. We touch on a good number of segments including Black Doom Award and REMIX!, but even ‘perform’ our bonus comic and reveal Toad’s 24-year-old mean-spirited secret. Numbers are useful, keep them in. Removing them would just fool yourself and others into thinking it’s not dragging on, anyway. Don’t you guys stop, though! I won’t let you! Aha! Finally, we get an official statement on the Musical Misfits. Thanks for that. OH NO THEY DI’N’T. I freaking LOVE Sonic 3 & Knuckles! That is a Black Doom Award well deserved! Those were some interesting performances… never knew you liked the comic that much. And a live audience?? And from what I can tell, microphones have improved drastically over the past 2 years. I made the connection as well, just because Cupid was in my head after seeing the Duck Hunt one. Haha, flipping the bird. Reminded me of the Flight of the Conchords episode. Shadow was an abomination. Ok, my first one was the Patapon one. Woah, weird that you already mentioned it in this podcast. Silly Sega. Hey, I mentioned the Winter Olympics. But let’s be honest, gameplay probably won’t save the game. The only thing that would save it would be …… ok, nothing would fit in that blank. I gave my Musical Misfit submission some thought, and I’ve decided to go with The Temple of Droplets, from The Legend of Zelda: The Minish Cap this time. Sorry about the double post. I would edit the last post if I could. Since you guys got this account thing started, you really ought to work on a feature that lets you edit your own posts. At least for a short while after posting. Also, I’ll try to resist making an IP switcher bot to click on the contest link. 1. The “tile icon” thing for the comic in the archives is a picture that isn’t from any part of the comic! There’s no tree in any of the panels. OK. Now I got that all out so I can sleep. How old is Lace, Ray? She’s available. I think. Yay, in before huge list so I can make my own. 1. I wouldn’t happen to be one of those naysayers, would I? Normally if I don’t like the comic, I don’t comment to avoid coming off as a prat. 2. It’s only named Sonic’s Ultimate Genesis Collection in the US. The Sonic name isn’t needed to peddle this stuff in other regions. Also, you should give it a fair shake. They’ve actually done a HUGE service to the games in general and while “Game X is missing ZOMG,” what they have there is not only very well emulated but also in one of the cleanest damn interfaces ever in a classic compilation. Also, unlike previous collections, this one supports save state functionality from emulators. I mean, cmon. Phantasy Star and Shining Force all in one comp along with Dynamite Heady AND all three Streets of Rage and you’re complaining about the ONE Sonic Game that didn’t make the cut? Might as well start complaining that Ecco Jr is missing too. 3. Actually, ChuChuRocket is the first Flash game ever to see a retail release on Dreamcast. So while you say “it’s the sucky Flash version,” that’s exactly the same version on Dreamcast. Might as well start complaining that Ecco Jr is missing too. I don’t understand this statement. Could you elaborate more for me so I don’t try to discuss something I may not be understanding correctly? Yes, we are all nerds. I would say keep the numbers on the podcast, it just makes it easier to go back and see which ones have been missed in case someone misses a week or something like that. Basically it’s like this. There IS no non-Flash version of ChuChu Rocket. Tim complained about the version of ChuChu Rocket being on that website was the Flash version. Dreamcast runs Flash natively as Sega Swirl (another Flash game on the Dreamcast) can attest. ChuChu Rocket was never a properly coded for Dreamcast game. Also, yes yes… we all miss Ecco Jr. I distinctly remember Chu Chu Rocket on the Dreamcast being made up of actual 3D polygons, but you spent 99% of the game looking at them from a top-down view so it only looked 2D. So until you can prove your case with evidence for me to read, then I’m going to have trouble believing you…. Get out of town…. really? Man… I would like to think that one relationship with a stranger made over the internet was enough with Tim, but……. Yay, I my Musical Misfit was picked, thanks guy’s. 😀 Great Podcast, I knew about Sonic 3 and Knuckles not being on that collection thing, really makes me mad how easily it was done on Mega Collection, but not this. Especially when it could’ve been done in only a few hours of coding to code the lock-on stuff. I thought the Spindash podcast was pretty good, my only problem was that they kept talking about the Comic, which I read, but I (and I assume it’s true) that none of the story is Canon. Also, I don’t know if you guy’s knew about this, but there’s this thing called “Project RINGO” that SEGA has shown to the public. (as seen here! – http://sega.jp/project_ringo/ ) It’s obviously tapping it’s foot like Sonic, so maybe it’s a new 2-D inspired game. It’d be neat to chat it up with ya sometime. A. You could always cap off the numbering at an even 100? hm. maybe not. B. Nice Remix but I’ll definitely have to download it because the clip went by pretty quick (given the length of the podcast, that’s alright I suppose). D. I’m not deluded, just brainwashed, er, what? E. Musical Misfits: Mysteries Made Manifest! F. Sonic 3 & Knuckles was the best version. Doomsday Zone? Awesome. Hopefully the Wii’s VC service will have some kind of solution if, and when, S&K is released because I’ve got Sonic 3 for VC. If not, it’s back to my PC version I got from Jack in the Box. For $2. Like, 10 years ago. Yay, Comment of the week again, I’m on a roll!! Anyways, awesome podcast again! Everyweek I wonder how they are going to do a better podcast, and each week it improves and improves. At some point, there will be a limit where it can improve no longer and any podcasts after will be a bitter dissapointment for long-time listeners. You should stop numbering them at that point. Gah, I looked it up in one of my old game design books and it seems I was mistaken. Time for me to eat crow. Here’s how I got confused. The game was prototyped in Flash and even all the levels were designed in Flash (thus why the browser bashed Flash demo on Seganet was essentially the full game. Sega Swirl IS Flash but Sega, at the time, was bragging about how the ease of Flash allowed them to prototype the design very quickly. In essence, I’m wrong and stupid…. The hiccups? Wiiiissse from your gw-*hiccup*-ave.
Don’t worry, I have a computer, my dad has one, On the plus side, My dad knows how to run the proxys and stuff. One Billion Clicks are coming right up. I have a real Genesis, with my REAL Sonic 3, locked on to my REAL Sonic and Knuckles carts. No, you’re not. Thanks for double-checking for me. That would have blown my mind if true. Oh yeah…if you asked me to chose between Shadow and Sonic and the Secret Rings, I’d pick Shadow. I couldn’t play Secret Rings for more than a couple minutes. I finished Shadow a couple of times. Quite a few “Who though that was a good idea! ?” moments, but the gameplay was fine IMO, but yeah whatever, this is really just to give some relevance to this: “Rouge”. this is really just to give some relevance to this: “Rouge”. It would be like giving umm…. Enhancements to one of the males to get females to play more Sonics. Comic Talk: What Tim is trying to say is “cop-out”, basically. Actually, I’d expect http://www.duelinganalogs.com/ to do comics that I wouldn’t think anyone else would do. You two come in close second. What? You didn’t copy pasta this week’s comic? Bravo, Ray. Bravo. I love seeing Illustrator works in outline mode. Oh my, a Dueling Analogs plug. I don’t play Castle Crashers, don’t own a 360 (waiting for PC versoin :P), and I still have their soundtrack when it was released on Newgrounds. Oh also, when are you going to actually start doing the recordings live? I basically go along with the podcast and answer stuff anyway, looks to me like many others do too. Seriously try something like ustream and just do your podcast live for once to a streaming audience. It’s 2009 for crying out loud. Really? I never played Shadow, but I thought SatSR was decent. Some of the controls were a bit frustrating, but I didn’t think they were bad enough to warrant not playing. 99% of the minigames (that I played; couldn’t stand to do them all) are terrible, but if you’ve played the carpet-pulling one with a couple of people, it’s AWESOME! Wait what, I thought we were delusional fans, not diluted. *Gets +10 nerd points* But I better understand it since I’m a chem major. Now I have to spend all day trying to think up a Chem joke with Diluted. Actually kinda curious, Do you guys remember what you talked about in the podcasts? Oh yes. I end up hearing the entire show multiple times from editing. Yeah, I know. That’s probably what it was, but I think she’s an interesting character. Like I said, I haven’t played many Sonic games, so my next statement might be completely moot, but she really seems to be the only one who got any sort of character development…’cept maybe Shadow, but that was just too over the top. WHAT??!?! Uncle Chuck??? That’s as good as having said Knuckles or Dr.Robotnik…Ray, how could you?? And seriously, I’d pay $50 for a Genesis Collection with Sonic 3 & Knuckles, all the other Sonic games, and a handful of like 5 of the “ultimate” Genesis games than this crappy $30 collection. Ugh. Yeah, You got me there, but that is just like saying that Luigi has more development than Mario. Both the Sonic and Mario series have little to no character development or backstory. Only the previous games count as canon, and that too is a tangled mess of conflicting storylines. Nice podcast. The only problem with your suggestion of doing a completely random one is that most of the people who would listen to it would have listened to this one. Both the Sonic and Mario series have little to no character development or backstory. Cool, I’m a chemical engineering major myself. Exactly. Which is why when one does get character development, it makes them awesome (see Rouge and Rosalina). And you were JUST arguing the other day that story isn’t important… tsk tsk. Good characters are good to any plot, no matter how small it is. Who knew when you first played Sonic Adventure 2 that Rouge was working for the government? I didn’t. I don’t like Mario Galaxy because it revolves (pun intended) around you flying off of planets and stuff. I want my platforming on the ground. I still hold to that. It’s not important, but yes, of course, it helps. I’m not sure if the characters really made the games any better though, because I still very much think Mario Galaxy is overrated and that a lot of Rouge’s stages were incredibly annoying. Man, I’ve been behind lately. First I’ll go to say Nice Podcast Guys for last week’s podcast, and Great Podcast Guys for this week! I can’t honestly remember all of the things I was going to say, but I do have a couple of questions. Also, is there any chance that we can get a downloadable version of the 2P START! theme? After listening to The King of Speed (or Rolling Start, not really sure), I didn’t realize that there was a bigger difference between the two songs than just the lyrics. It’d be really cool for me to be able to listen to the entire thing without it being cut off by the podcast. First of all, whatever happened to Trivia for Two and Trivia for You? I think this may have been asked before, but I’m not entirely sure. I rather miss those segments. Even though I’ve been reading 2P Start from the beginning, I’ve never commented, or listened to the podcast. Rise from your grave, etc. etc. Anyways, I really enjoyed the whole thing and I’ll be coming back for more next week. Thanks a lot guys! 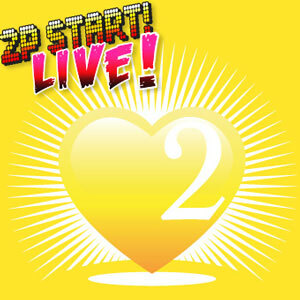 I personally like the use of video game midi for the background sound and music for 2P Start Live. While these are great sound effects, they don’t really reflect the 2P Start Live feeling. But that is just my opinion. I expect 2P Start to do what no one else does because they never swear, they never use excessive violence, and the characters they use (comic Tim and Ray) are not stupid, selfish, or vulgar. 2P Start is unique because they do not rely on the common crutches of gaming comics. This alone sets 2P Start apart from other comics. It doesn’t hurt that the stuff you find here is usually pretty good. I get the feeling from the last few podcast that you try to avoid Tim and Ray humor in the comic. I would personally like to see more of comic Tim and Ray. They are fun characters. I would love to see “Trivia for You” make a come back. Listening to the “Rise from your grave!” reminded me of the old black doom “The end is near!” that we don’t hear anymore. What happened to that? A couple of other good clean webcomics are F@nboy$ (although his updates have been sparse recently) and Brawl in the Family, which I found not too long ago but has probably already become one of my favorite webcomics. As the name suggests, a lot of it is Nintendo related, with Kirby being the main focus. Just thought you might want to check either of them out. BooYah! comment of the week on the two year anniversary podcast. Happy (belated) birthday 2pstart. I’ll check out fanboys (if i can tear myself away from 2pstart) also digital unrest is usually decent and of course BATSRPG be lewelyk (whose name i probably misspelled. sorry) Also i get +15 nerdy points for getting both chem jokes, even though i’m not a chem major. And in conclusion 2pstart is awesome for all the reasons dr. oswald listed. Oh yeah, forgot about that one. Although I don’t usually get the WoW jokes, but at least she does some Zelda ones occasionally…unlike some people. 😛 Seriously, there’s been what, one Zelda-specific comic here? But I do notice that usually I find cleaner comics funnier than ones with excessive profanity and stuff. Even stuff like homestarrunner.com (not a webcomic, but sitll) is awesome, and that’s clean. If you think Awkward Zombie is random and F@nboy$ is sparse, Dresden Codak has both of them beat in each category; by about 100 fold. Thanks for the suggestion, zeldario. I don’t have any plans to roll out some sort of secondary podcasts at this point, though…. I’m not sure I want to distill content from our usual podcast unless there was a really, really good reason for it. Well, if people want a second podcast and they also want an unedited podcast, how about this: you take all of the parts that get edited out, compile them together (without context clues from the real podcast), and make a secondary podcast out of that.